Trecoose Lodge has been completely renovated and newly furnished as a quality holiday home. It’s on the outskirts of St Martin village in the heart of the Lizard Peninsula, an Area of Outstanding Natural Beauty where you are never far from the sea. Helford village on the picturesque River Helford is nearby, with its thatched cottages and popular pub, the Shipwrights Arms. From here you can walk the South West coast path which goes all the way to the most southerly point at the Lizard and offers some of the most dramatic cliff top scenery in the country. You can also take a water taxi across the Helford River to explore Glendurgan and Trebah gardens. The beaches at Porthallow and Coverack are both easily reachable by car too. Entered from the private parking area with space for two cars, up a few steps onto the decked area and into a utility room; ideal for coats and shoes. In the utility room is a washing machine and a separate WC with toilet and handbasin. The open-plan kitchen, dining and living room is spacious, light and airy yet still a cosy space to settle down in the evenings. The kitchen is smart, well stocked and fitted with new Bosch appliances. There’s a fridge/freezer and dishwasher, a gas range with 5-ring hob, two ovens and a grill, also a microwave, kettle and toaster. The living room has two sofas, TV (newer larger one than pictured) with Freesat and a DVD player. For dining, the table has six chairs and looks out across the decking, over the field and to the trees beyond. 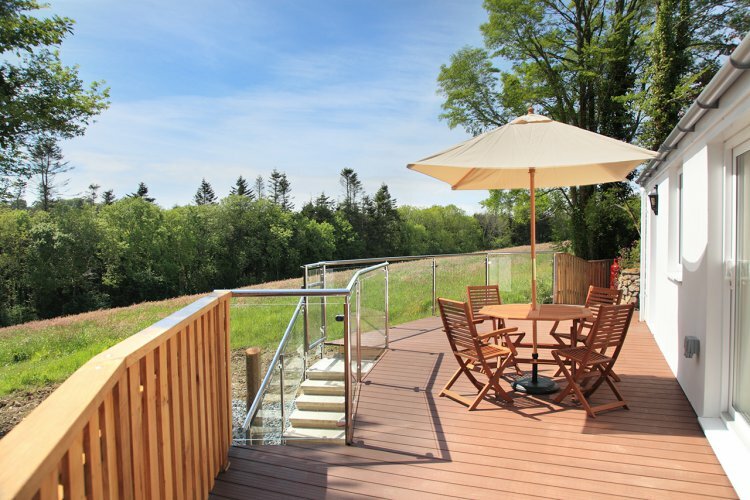 Open up the sliding doors to the decking to let a little of the outside in, or take dinner out and use the outdoor furniture on those sunny evenings; it’s a suntrap in the afternoon. Both bedrooms are off a hallway, the main bedroom is en suite and has a king-size bed, large wardrobe and bedside tables with lamps. The en suite wet room features underfloor heating, large shower, toilet, bidet and a handbasin with light up mirror and shaver socket over. Bedroom two has twin 3’ single beds with their own lights overhead, wardrobe and two drawer units. Opposite bedroom two is a wet room which also has underfloor heating, shower, toilet and handbasin with mirror over. Outside there is a lovely raised decked area where you can sit out . There is a larger communal garden that leads to woodland and a footpath that trails out across the surrounding countryside and Trelowarren. The communal garden and woodland area is shared with the nearby owners and their guests whilst the front garden remains private. Due to the nature of woodland children should be supervised. There are two other private residences nearby that share the peace and tranquillity of Trecoose but without overlooking the Lodge’s outdoor areas. Rental includes: Central heating, bedlinen, towels, WiFi and electricity. This is a non-pet and non-smoking property.